World famous Yue Opera in Poland! 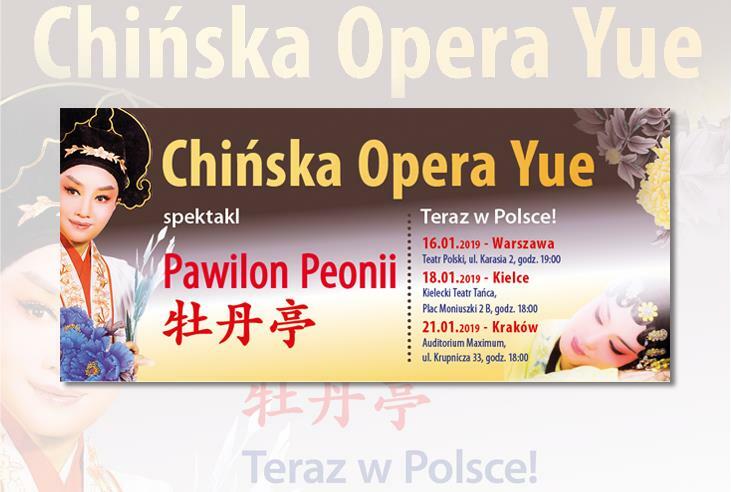 The Yue Opera spectacle will take place, celebrating the approaching Chinese Year of the Pig, in mid January in Teatr Polski in Warsaw. Artists from the Zhejiang province will perform the moving work “The Peony Pavilion”. The event is organized by the Chinese-Polish Foundation for Communication and Development CPFCD, in partnership with the Polish Circles of Art Foundation, organizers of the Polish Circles of Art Festival in China. The Yue Opera is one of the most popular Chinese opera forms. Its history dates back to the year 1906, originating from the city of Shaoxing in the Zhejiang province. Polish audiences will see the spectacle performed by the Zhejiang Yue Opera group. It was established in 1952 in Hangzhou and is one of the most well known Yue opera groups. The opera “The Peony Pavilion” is a ancient play from the times of the Ming dynasty. It describes the romance between Du Liniang, daughter of an important official, and the scholar Liu Mengmei. Du falls tragically in love and perishes, yet the feelings of the protagonists are stronger than death and the two lovers are reunited. The spectacle will take place only three times: in Warsaw, Kielce and Kraków. It’s a one of a kind opportunity to see this vibrant and unique Chinese opera show of in our country.